Laptops and notebook computers are getting thinner and lighter all the time, and that makes it more important than ever to protect them from being damaged while you’re carrying them from place to place. Laptop bags have been around as long as laptops themselves, but most people these days seem to prefer carrying their machines in laptop backpacks. If you’ve been looking for a great laptop backpack at an affordable price, let me tell you about one that I really love. I recently had the opportunity to check out the AmazonBasics Backpack for Laptops, and I believe it’s the best backpack I’ve ever used in regards to style and functionality. 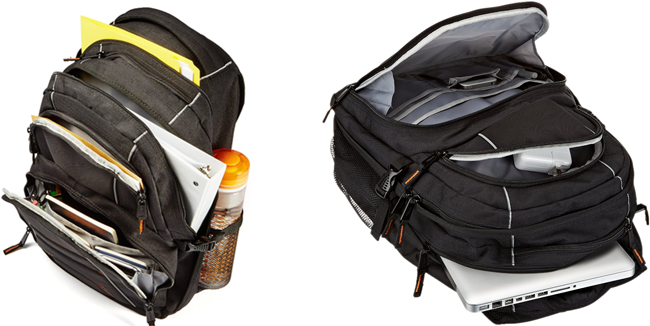 This backpack has multiple compartments for carrying a wide array of items. The padded laptop sleeve will hold any laptop or notebook computer up to 17 inches, and there’s also a smaller sleeve for your tablet. Other compartments will hold your keys, your phone and most any other small items that you need to take along with you. There’s even a mesh pocket for a water bottle on each side! With all of these storage areas you might expect this backpack to be a bit on the heavy side, but it actually weighs just two pounds, which is very reasonable as backpacks go. The nicely padded straps and excellent weight distribution make this one of the most comfortable laptop backpacks I’ve ever used, even when fully loaded with gear. Of course the most important feature in any laptop carrying case is the protections it provides for the laptop itself. I found this backpack’s laptop sleeve to be well padded and secure, and that means you’ll be able to take your laptop most anywhere without having to worry about it getting damaged. 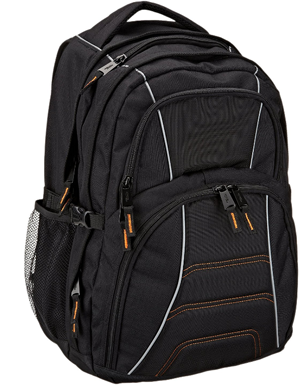 Bottom line: There are plenty of laptop backpacks out there that cost more than this affordable AmazonBasics model, but I don’t think you’ll find a better one for anywhere near the same money. Click here to read more about the AmazonBasics Backpack for Laptops at Amazon, including almost 3,500 overwhelmingly positive user reviews. Bonus tip #1: Did you know you can get 1-year Interest-Free Financing on your Amazon purchases? Well, you can, and this post has all the details!